United States veterans serve our country with pride and bravery, constantly putting themselves in dangerous and traumatic situations. When many of these men and women return back home, they face the harsh reality of the wounds they received overseas, some physical and some mental. Many veterans turn to medical marijuana as a safe alternative to addictive opioids. 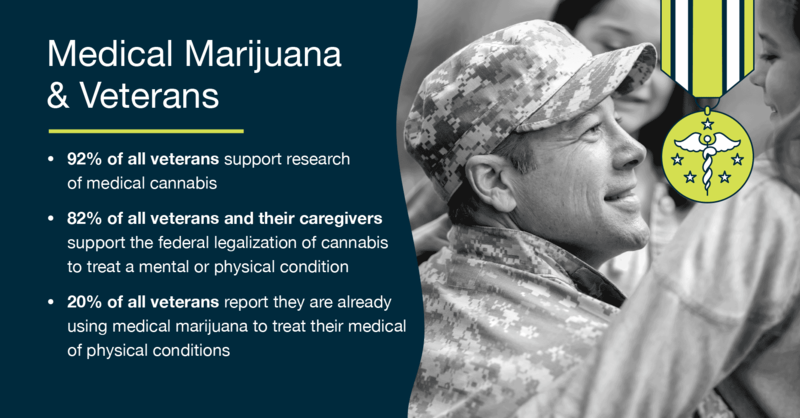 This guide includes everything that veterans need to know about medical marijuana treatment. Use the table of contents below to jump to a specific chapter or browse through the entire guide. After years of research that have shown medical marijuana to be a safe alternative for physical and mental pain, there is still a lot of push back from the federal government and many states in regard to its use. This can complicate the process that veterans go through in order to seek treatment when their medical coverage is provided through a federal entity, such as the VA (Veterans Association). Many veterans shy away from legalized medical marijuana because they worry about losing their VA benefits. However, veterans can rest assured that the VA supports veterans in their quest for cannabis treatment to the extent that federal law will allow. Although the VA does not endorse or prescribe medical marijuana, veterans can legally access marijuana in states that have legalized medical marijuana without ramifications from the VA. It is important to learn about the risks of any treatment, it is also important to understand the vast differences in treatment options and types of strains. Different chemical compounds in marijuana have different effects, proposed legislation, pros, and cons. Let’s go over arguably the most important and researched chemical compounds in cannabis, THC (tetrahydrocannabinol) and CBD (cannabidiol). The legalization of marijuana has become a topic of debate across the country. State and federal jurisdictions all have their own ideas about whether marijuana should be legal or not. With every election, more and more medical marijuana legislation ends up on statewide ballots. Though there have been legislative attempts to legalize marijuana for veterans, federal legislation in favor of medical cannabis has yet to be passed. A recent example of this was an amendment introduced in 2018, the Veterans Equal Access Amendment. This amendment was brought to Congress to protect veterans’ rights when seeking medical cannabis treatments from the VA. Unfortunately, the amendment was removed by a small group of congressional leaders. A possible cause of opposition could stem from the lack of information about the benefits of medical marijuana and funding for medical cannabis research. There is also a lot of misinformed rhetoric about medical marijuana. More and more states are legalizing medical marijuana. Each state has their own nuanced rules about marijuana, so make sure to check marijuana laws where you live. As of this past election, 13 states have decriminalized weed, but they did not legalize the sale of medical marijuana. This decriminalization means that those who are found with small amounts of marijuana products will not be subject to any legal ramifications but businesses don’t have the approval to sell marijuana yet. Some states have legalized all forms of marijuana, some only for medical purposes. In some states, it remains completely illegal. 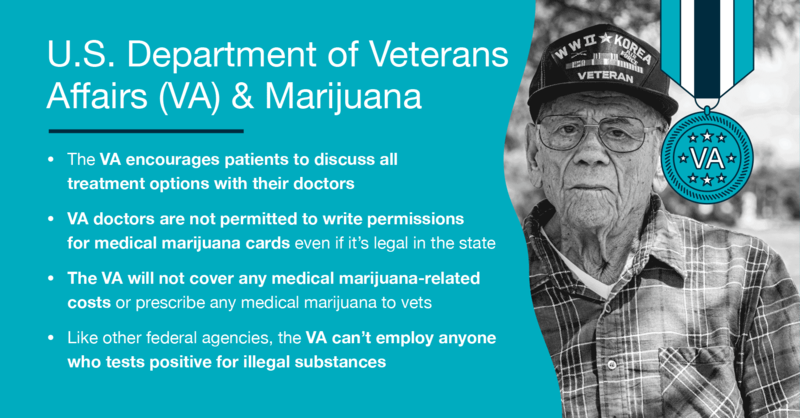 Veterans are held to statewide rules in every institution except for government entities, like the VA. Veterans cannot expect VA coverage for medical cannabis even in states where it is completely legal. The federal government has not yet legalized recreational or medical marijuana. They classify marijuana as a Schedule I illegal substance, meaning that marijuana is believed to hold no medical value and has a high potential for abuse. Schedule II drugs like cocaine and methamphetamine are classified to have less chance for substance abuse. The classification system rates substances from I–V from the highest potential for abuse to lowest potential for abuse. It is important to note that since the military is under federal jurisdiction, active military members are not permitted to use medical marijuana. However, the rules differ for veterans. Veterans are held to statewide rules, unless there is a federal government entity involved, like the VA.
Due to its stringent classification, it is hard to obtain the federal funding and clearances necessary to conduct a large-scale trial to test the medical value of marijuana. The federal government’s policies and the lack of medical cannabis research puts many companies in a tough spot because they may fear ramifications from the federal government. Many businesses don’t want to become involved in the marijuana industry because of the federal stance. Businesses maintain the right to have a marijuana-free workplace and can include that clause in an employment contract and terminate any employees who test positive, even in states where marijuana is legal. There is a long history between veterans and cannabis. Use of marijuana while on active duty has never been supported by any of the military branches, but many veterans have reported that it is one of the only ways they could relax from the incredible stress of war. Marijuana grew in the wild in parts of Vietnam, so many soldiers would use it to treat their physical pain and inability to fall asleep. Another issue that plagues veterans is PTSD (post traumatic stress disorder), the Journal of the American Medical Association (JAMA) reported that 270,000 Vietnam veterans still dealing with combat-related PTSD. 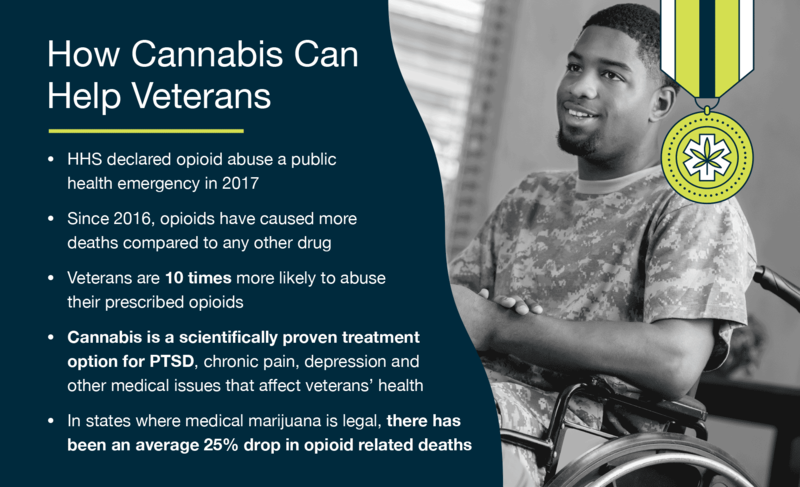 Though there is still a lot of opposition, there has been progress—veterans today have much better access to medical marijuana as it becomes more widely accepted and decriminalized throughout the country. There are many states that have legalized medical marijuana and many organizations that are dedicated to providing veterans with medical cannabis. The Department of Veterans’ Affairs (VA) is a federal entity and so it must follow federal regulation and law. In an effort to support all veterans’ needs, the VA’s policies are as close to supportive as they can be without endorsing medical marijuana. They don’t encourage VA doctors to recommend medical marijuana, but encourage patients to ask their doctors questions about this treatment. Veterans who use state-approved medical marijuana are eligible for VA coverage for medical marijuana use. A veteran who is already using VA services will not lose their coverage if they begin participating in state-approved medical marijuana programs. The VA encourages patients to discuss all treatment options with their doctors. And while VA doctors don’t actively promote medical marijuana, they will answer any and all questions while maintaining HIPPA’s patient confidentiality. VA doctors will keep medical records for any patients who disclose their medical marijuana use, and these files are protected under privacy law. Veterans should talk to their doctors about their best treatment options without fear of ramifications. Many states require those interested in medical marijuana treatment or a card to be evaluated by a physician who can certify that they are in need of medical cannabis. VA doctors are not permitted to write permissions for medical marijuana cards, even if it’s legal in the state. The best they can do is refer their patients to another doctor’s office that can assist them in obtaining the certification they need. The VA will not cover any medical marijuana-related costs or prescribe any medical marijuana to vets. Veterans will have to pay out of pocket or connect with organizations that help veterans with obtaining treatment through medical marijuana. VA doctors are only allowed to prescribe FDA approved products. Most THC and CBD products aren’t FDA approved. Like other federal agencies, the VA can’t employ anyone who tests positive for illegal substances. Any veterans who are employed by the VA are subject to random drug testing and are subject to termination if they test positive. Marijuana research is still in its early phases, but as of 2017, 22% of veterans use medical cannabis to treat and relieve the symptoms of ailments like PTSD, chronic pain and depression, among other things. Cannabis accounts for zero deaths every year while prescription opioids account for 115 deaths daily. Aside from marijuana’s medical benefits, the fast-growing field is a great employment opportunity for veteran employment. There are a variety of job opportunities in the field from research, business management, entrepreneurship, creative design, soil and plant science, sales, as well as cultivating the marijuana strains itself. Caring for plants and gardening is also a very therapeutic activity for many veterans. Post-traumatic stress disorder (PTSD) is all too common among veterans. It plagues the veteran community and usually hits three to four months after veterans return from deployment, although PTSD can appear at any time in a veteran’s life. PTSD and depression go hand in hand which makes it so important to seek intervention if experiencing any PTSD symptoms. Some of these symptoms include flashbacks, mood changes, avoidance and other out of character reactions, emotions, and feelings. Many veterans have found treatment in medical marijuana combined with therapy. One common therapy for PTSD is cognitive behavioral therapy (CBT). This form of therapy involves confronting, understanding and altering thought surrounding a certain trauma. Many veterans experience PTSD symptoms that affect their social and family life. Proper treatment is crucial for all involved, including loved ones. There have been some studies that point to medical marijuana as a legitimate treatment for PTSD. In fact, a New Mexico Cannabis Program ran a study and found that the majority of patients had a more than 75 percent reduction in PTSD symptoms while using cannabis compared to when they were not using cannabis. Many veterans live with combat-related chronic pain, a debilitating condition that permeates everyday life and makes the simplest tasks painful. Many doctors prescribe opioids as their first choice for dealing with chronic pain. Opioids cause side effects like anxiety, constipation, lack of interest in life and mood swings. The VA reported in 2016, that they treated 66,000 veterans for opioid addiction. Medical marijuana is proven to be a non-toxic effective treatment for pain. The marijuana works with and blocks pain receptors. When comparing medical marijuana with opioids for pain, it is important to note that opioids are extremely addictive and when abused, can be deadly. There are over 3 million reported cases of depression in the United States. Unfortunately, depression is another serious problem that affects veterans. We lose 20 veterans each day to suicide, a devastating problem that desperately needs to be addressed. The first step is to seek help and speak out about any symptoms or underlying causes. There is a large range of causes for depression, but the experiences and trauma related to service and combat can play a huge role in a veteran’s depression. Many veterans who’d like to seek help, may feel as though there are barriers that keep them from doing so. Some of these include the stigmas surrounding mental health, long wait times, limited access to help and fear of what others will think. The Veteran Crisis Line is a great resource for veterans who are experiencing or think they’re experiencing symptoms of depression. Marijuana has been used as a treatment for depression, as it helps lessen depressive feelings. Research for mental illness and medical marijuana is still in its early phases, but many small studies and surveys showed positive trends in favor of marijuana as a treatment of depression. These organizations aim to connect veterans with medical marijuana treatments that will work for them. They are advocates that support veterans and their right to seek the best treatment possible. The Veteran Cannabis Group aims to improve the lives of veterans by providing safe access to medical marijuana and its healing benefits. They recognized that of the 32 million veterans living in the US, 80% of them support medical cannabis programs. Not only does VCG work to connect veterans with safe access to marijuana, but it also connects veterans with employment opportunities in the marijuana industry. Americans for Safe Access is an organization that is committed to ensuring safe and legal access to medical cannabis. They produce a series of publications to educate lawmakers, patients, physicians, and the public. They also work to ensure that veterans have access to the best treatment. Hero Grown’s mission is to connect veterans, first responders and their families to medical marijuana. Hero Grown was started to combat the epidemic of opioid abuse. Since its origin in 2014, Hero Grown has given away two million dollars of medical marijuana to veterans and first responders. The Santa Cruz Veterans Alliance aims to connect veterans with cannabis to treat combat-related PTSD. They focus on cannabis education and advocacy and provide a platform for veterans to learn about VA benefits and services. SCVA hosts free, open conference calls where those interested can listen in on the latest news surrounding medical marijuana. The Weed for Warriors project is committed to providing veterans with medical marijuana. To qualify, veterans must show proof that they have been recommended for treatment. They are always looking for more veterans and encourage them to fill out this contact form to learn more and possibly get involved in the Weed for Warriors movement. In addition to the organizations above, this list includes resources that may be useful to veterans. This includes helpful resources for finding more information and getting involved. The most recent election proved promising for the future of veterans and marijuana. 32 states and Washington D.C. have legalized marijuana and three more pro-legalization senators were voted in. This is a small step forward to getting marijuana legalized federally. There are 37 bills sitting in Congress with the goal of descheduling marijuana and getting the United States on a path of safe access and legalization. There is still opposition but the tide is slowly and steadily changing. In addition to keeping up with individual pieces of legislature, there are a lot of great online sources for staying up to date on medical marijuana news. News that could be beneficial to look out for include elected officials’ stances on medical marijuana, new charities and businesses that support veterans, and upcoming studies. There are many studies that are set to take place, like this study that is going to research the effects of medical marijuana on veterans with PTSD. The future of cannabis for veterans is looking promising. With growing public support and new legislation passing with every election, medical marijuana is in an upward trend. There has been a huge increase in CBD research, which may help more people to recognize marijuana for its medicinal value. Getting veterans country-wide access to medical marijuana is a huge priority for many elected officials. National opinion is sure to slowly shift as more states legalize and decriminalize cannabis and show positive results economically and in reducing opioid dependency. The process of obtaining safe and uninhibited medical marijuana for veterans has come a long way — though there is so much more that needs to be done. The list of states where marijuana is legal is steadily growing, but marijuana remains illegal under federal jurisdiction. Many lawmakers have been pushing for decriminalization, but the recent Veterans Medical Marijuana Safe Harbor Act could be a turning point for veterans seeking medical marijuana treatment. When considering treatment options, it is important to speak to a doctor and to understand the different marijuana strains and products to find the right fit for you. In addition to healthcare providers, there are strong networks and communities that support equal access. The growing public support of medical marijuana, along with the new legislature, is a very promising sign of what the future holds for veteran healthcare.